For our cooking events and workshops we have a lot of ideas – for example this delicious recipe! For those who never really knew what to cook with winter vegetables, this recipe will pep up their winter menus! Clean and dice the button mushrooms. Peal and dice the potatoes. Peal garlic and onions, chop them finely and sauté them in butter. Add thyme, mushrooms and potatoes and sauté until the liquid is gone. Season with salt and pepper, add parcel and breadcrumbs. Cut chicory in half and throw away the stalk. Heften up white whine, lemon juice and orange juice, add sugar and sauté the chicory halves in the brew. Give the chicory halves in a gratin pan, add the potato mushroom mix and some of the sauté juice. Bake shortly at top and bottom heat. 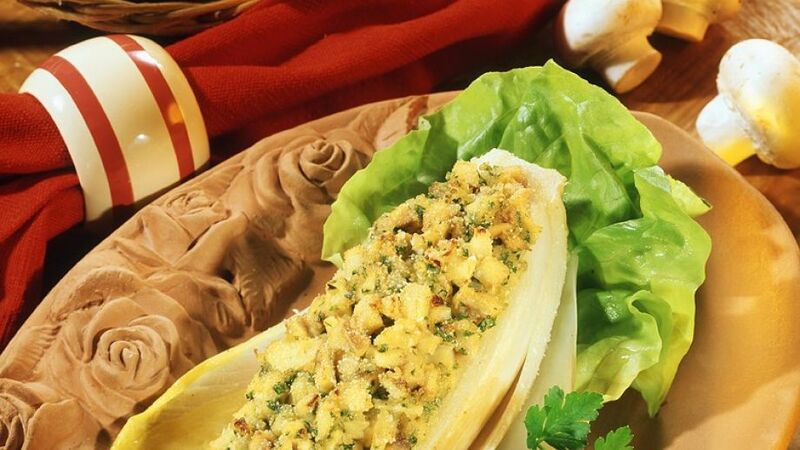 Even Touch, chicory is not the star among the vegetables, it offers many options. Chicory is rich in vitamins and minerals and can help to create a healthy intestinal flora.